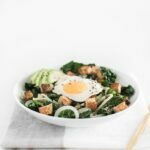 Where are my breakfast salad fans? 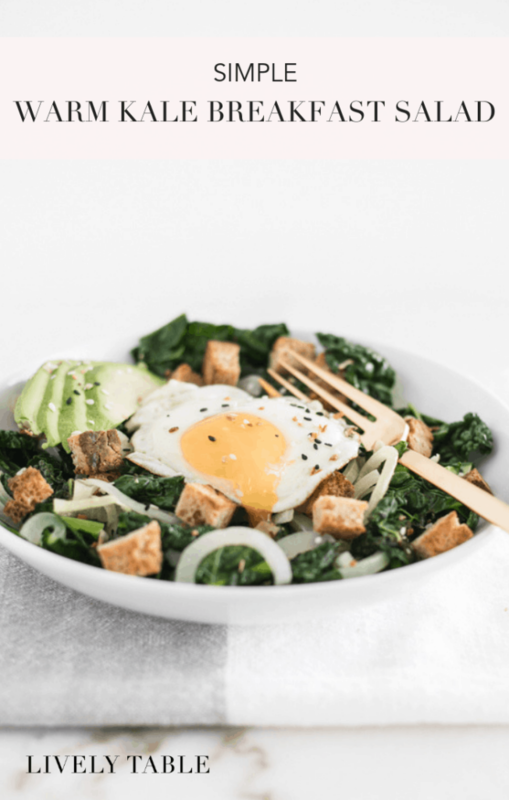 If you’ve never had a breakfast salad, consider yourself enlightened. They’re delicious. 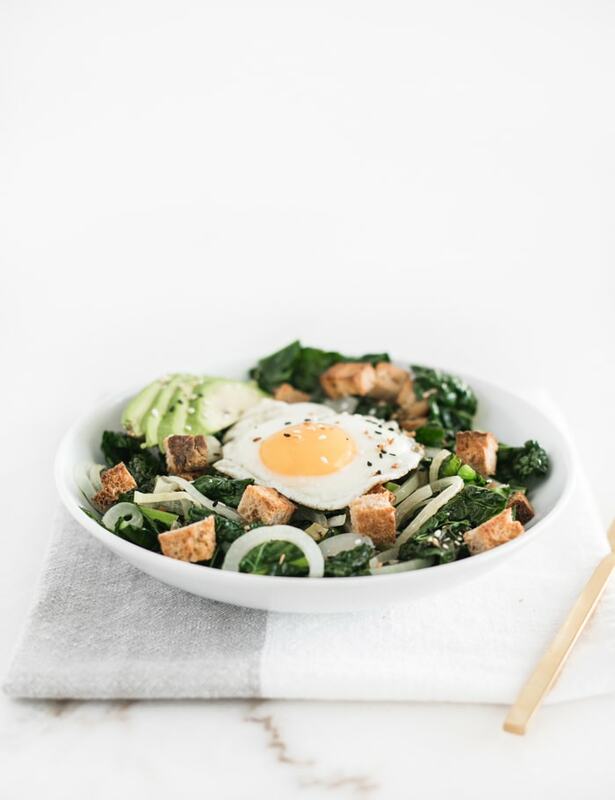 Like a healthy, tasty, brunch you can make at home. 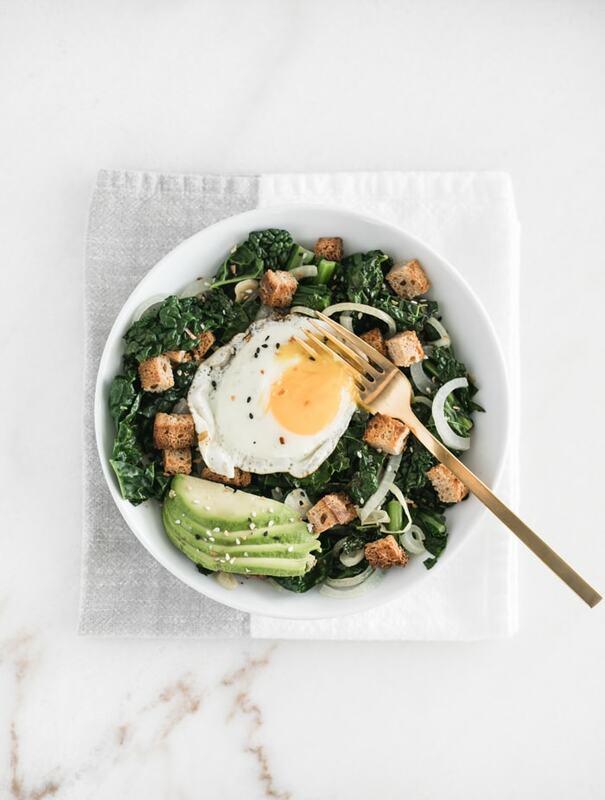 One of my favorite ways to make a breakfast salad, especially in the winter, is with warm, garlicky kale. It makes for a hearty, comforting salad that is absolutely crave-worthy. 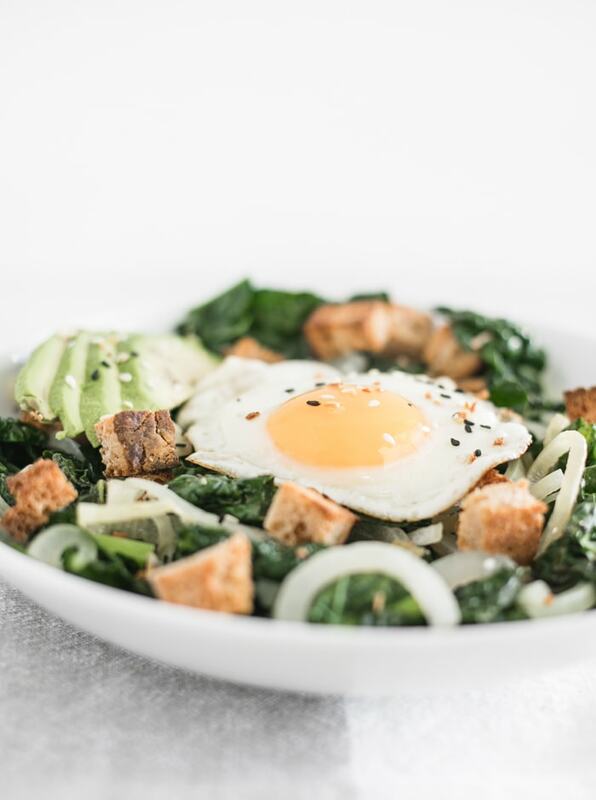 How can you not crave something with a runny fried egg, creamy avocado, sourdough croutons? It’s like deconstructed egg and avocado toast. But on warm, wilty kale. And with caramelized onions. That you eat with a fork. Ok, so it’s not avocado toast. But it has all of the delicious components of avocado toast, and then some. And hello, it has everything bagel seasoning, so it has to be good! 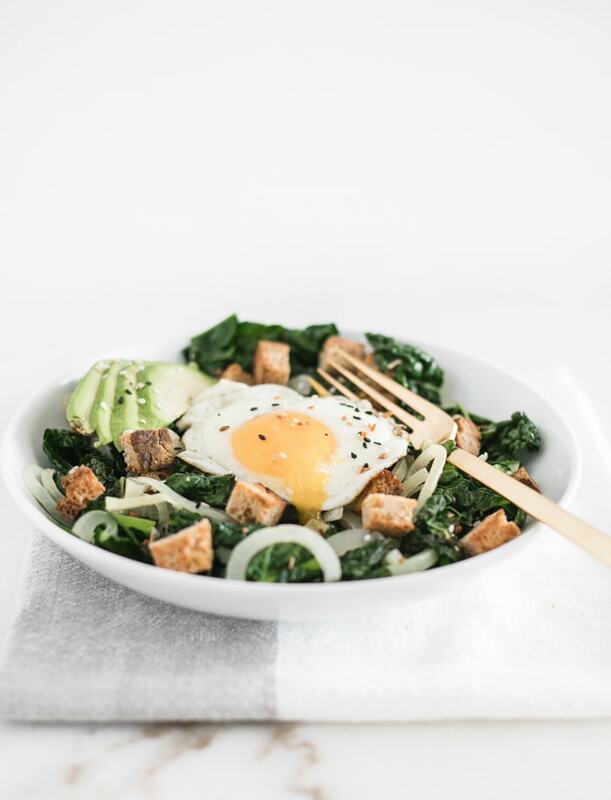 This warm kale breakfast salad is easy to make your own. I love it for using up day-old sourdough and kale that might be past it’s prime, but feel free to use whatever you’d like. Add some crumbled bacon if that’s your jam. Toss in any veggies you have that might need to be used. Use a different bread you have on hand, or don’t use any at all. Add nuts. Add cheese. Or don’t. It’s totally up to you! 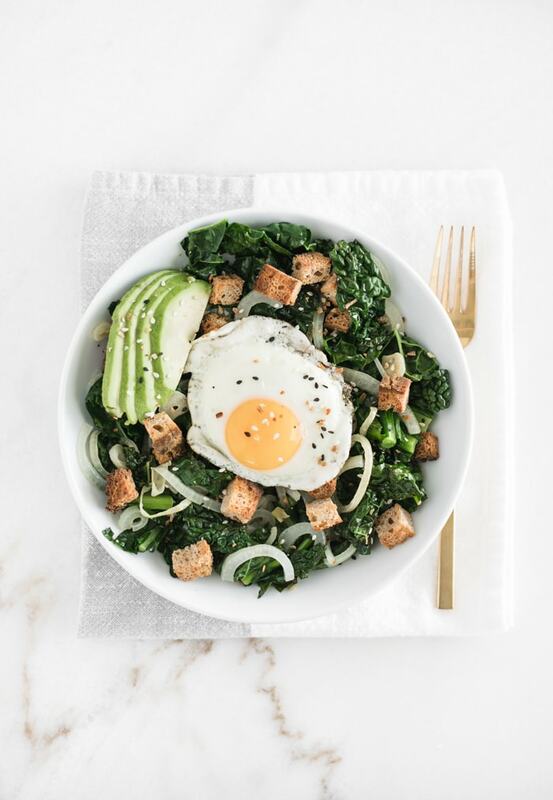 This cozy, delicious, warm kale breakfast salad is just a base. Take it wherever your imagination, or refrigerator contents, go. Have I convinced you yet? Yes? Good.